I'll see this. There is a still poster of the Black Panther that looks like it was made in paint. wags83 wrote: I'll see this. 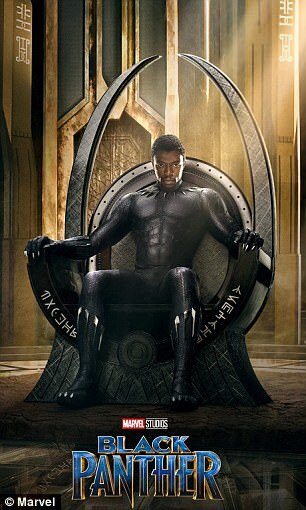 There is a still poster of the Black Panther that looks like it was made in paint. LOL. That's as bad as the Spiderman one. Who thought that was a good idea?! So I never read any comics, but I've gotta say, all the cartoons that show the Avengers that take place with the Blank Panther are always wayyyy cooler. Oh, look, a giant amazonian stone building, OMG ITS GOT LASER CANNONS. Out in a week. 100% on RT with 64 critics. Once again with Marvel I went from "meh, I'll see it eventually" to "I will 100% see it in theaters". Question now is if Jocelyn wants to see it. If not I'll go alone opening morning. Saw it today, and like almost all Marvel movies, it was really good. The cast was huge and everyone was great. Almost every character you will recognize from something (Get Out, Black Mirror, etc). It might have the fewest laughs out of any Marvel movie. T'challa's sister had some great lines, "You know what I call them? Sneakers", but other than her very few characters made jokes. I'm okay with this being a more serious movie, but it really stood out since the last Marvel movie I saw was one of the funniest. Killmonger was an amazing villain and probably my favorite part of the movie. I liked that he legitimately won the throne because he was a better fighter. I dug his look and how he stood by his beliefs until death. Micheal B Jordan is a beast! Ryan Coogler and him need to stick together. T'Challa surviving the waterfall was predictable and even lamer than I was expecting. "A fisherman found him". I was hoping he would be 'dead' for more than just 10 minutes. Forest Whitaker basically had the same role in this as he did in Rogue One. The CGI budget of this movie must have been insane. Andy Serkis motion capturing as a white guy looked totally convincing. The final infinity stone didn't show up?! will try and see it today.. sounds like it may beat some records. We saw this yesterday, too. I also really liked this and was in the boat of "I guess if he wants to see it I'll go" to "yeah I want to see it, too." Glad we did because the scenery was really cool on the big screen, especially flying into Wakanda for the first time. I also agree that there was some comedic element, but very little compared to the last Marvel we saw (latest Thor). I didn't mind that it was serious because it never seemed too heavy and the fight scenes all had a purpose. Erin wrote: Glad we did because the scenery was really cool on the big screen, especially flying into Wakanda for the first time. I wish we got more of the modern Wakanda. The big battle at the end made sense to happen in the open fields, but I wanted more action in the city. The car chase scene in South Korea was especially fun, would have been cool to have something like that in Wakanda too. Erin wrote: Source of the post I loved Michael B. Jordan when he was starting out as a guest star on "Parenthood," so it's neat to see how his career has taken off. Has Martin Freeman had much of a role in other MCU movies? I feel like we've seen him but it hasn't been in a big capacity. This movie makes it seem like he could maybe have a bigger role in future MCU movies. Best comedic part was when the giant charging rhino stops and licks Michonne's face like a puppy.